The first sunrise of 2018 was a memorable one! 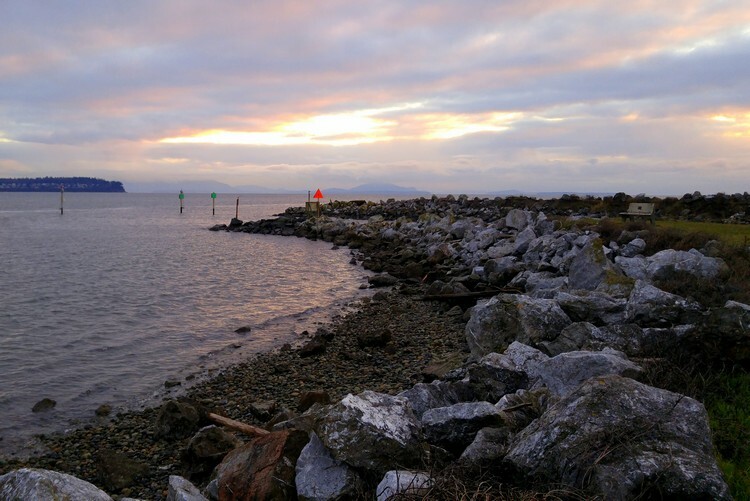 This year we rang in the New Year with friends at a cottage in Birch Bay, located in Washington State about 30 minutes south of the Canada-USA border. We wanted to get away for a few days, but didn’t want to travel too far. When our friends invited us to join them at a cottage in Birch Bay, it was an easy decision. 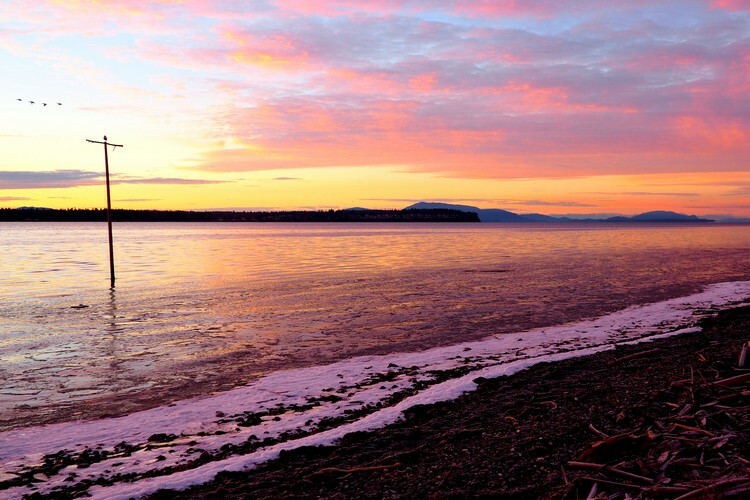 There’s not a whole lot to do in Birch Bay during the winter months, but that’s exactly what we were looking for. 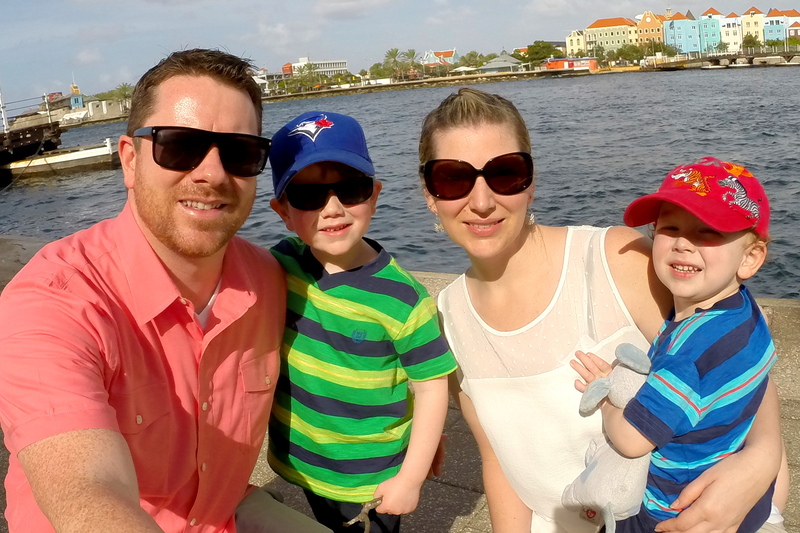 Our friends also have two young boys, so our game plan was to relax, enjoy a few bottles of red wine and BBQ some big fat steaks. We used to go out and celebrate NYE in a big way, but that was before having kids. Now, we enjoy a few adult beverages and watch the ball drop in New York’s Times Square – which is 9:00 PM Pacific Time. It makes us feel like we stayed up until midnight and gives us an opportunity to pop a bottle of bubbly while our boys are still awake. We give them a glass of sprite so we can all have a New Year’s cheers. We don’t normally make it past 10:00 PM these days. Once upon a time I thought that was lame, but these are different times. You appreciate sleep so much more when you have young kids. One of the advantages of going to bed early is that we sometimes get to witness a beautiful sunrise. The first morning of 2018 in Birch Bay was one of those mornings. 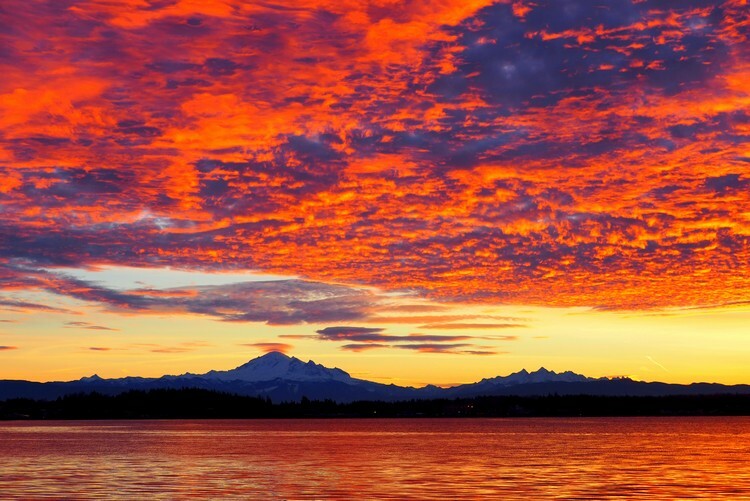 In early January, the sun rises around 8:00 AM in the Pacific Northwest. We rolled out of bed around 7:30 AM that morning, which is still considered sleeping in for us. I poured myself a cup of coffee and looked out the window. I couldn’t believe my eyes. The sky was out of control! I quickly grabbed my camera and ran to the beach, which was only 2 minutes from the cottage. That is actually snow and ice on the shore. It was a cold night. That snow-capped volcano in the distance is Mount Baker. It’s the most heavily glaciated of the Cascade Range volcanoes. The volume of snow and ice on Mount Baker is greater than that of all the other Cascades volcanoes combined (except Mount Rainier). Look at that sky! We’re taking this as a positive sign for things to come in 2018. This is what Birch Bay looks like during the day, after the clouds disappeared. Searching for sea treasures and crabs on the rocky beach. When we were at the beach one afternoon, I overheard a few residents talking about the red lights that will happen on New Year’s Eve. She said that at 7:00 PM residents around the bay will light red flares and fireworks. It’s an interesting idea, so we made sure to return to the beach at 7:00 PM that evening. Sure enough, there were red lights surrounding the bay. If you look at the photo below, you can see the red lights along the shoreline. Mount Baker would be located behind that row of red lights. We hope this is the year you crush your goals and fulfill your travel dreams. Beautiful! I love the look of ice on the bay! I’m glad you enjoyed Birch Bay.